Introducing the new IT Knowledge Exchange – featuring a new homepage! In the beginning, there was IT Answers. But as we all know, the IT Knowledge Exchange community has grown well beyond Q&A to include activity of all types, with our members discussing the latest tech industry news, publishing blog posts on everything from cloud computing to Chromecast, interacting with TechTarget editors and experts and, yes, asking and answering technical questions. It’s about time we had a site that really features all that activity and growth. Today, I’m pleased to tell you we have one. 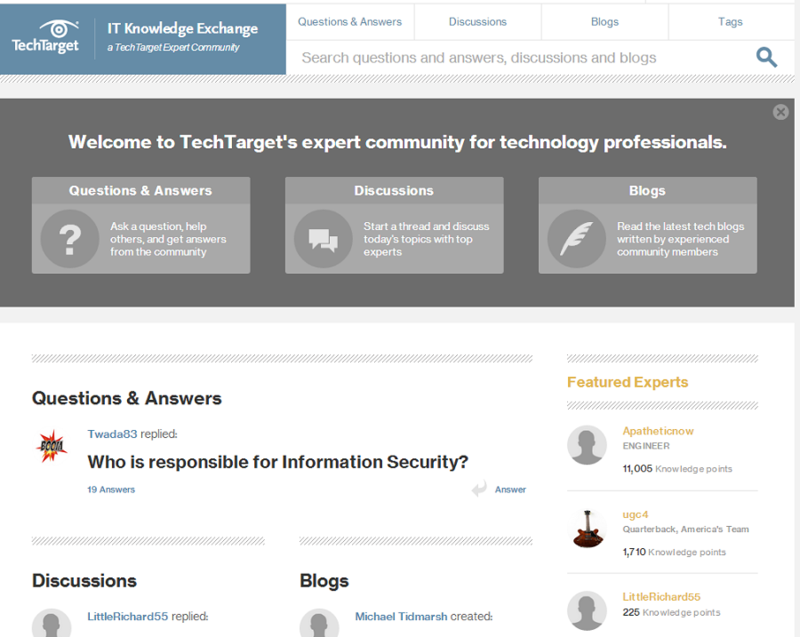 If you haven’t already, check out the new IT Knowledge Exchange homepage at https://itknowledgeexchange.techtarget.com. The first thing you should notice (well, aside from the welcome box, which you can close and never see again as long as you’re logged in) is that the URL stays there – no more redirection to the IT Answers section. Update your bookmarks accordingly! Now you will find all the latest community activity in one place. We’re surfacing the latest and greatest items (and people!) so that you can quickly find what you want, or stumble across something you didn’t even know what you were looking for. – Edit your profile. One thing you’ll probably notice is a lot of pictures; we’re plastering your expert mugs across the new homepage, on questions and in discussions. So you’ll want to make sure you have a good picture to go along with your profile. To make that change, click on your username in the header on any page. – Keep an eye on activity. The main section on the homepage features the most recent activity in each of our main content areas (Q&A, Discussions, Blogs) as well as some featured users. Don’t be surprised if you see your face there occasionally. This section will update as fresh content comes in, so you can always check here for new stuff. Further down the page, you’ll find sections for Q&A and Discussions with longer lists of content. Click into any section title to view the full page for that section, which features even more recent content (your familiar lists will be here). – Follow topics. Topics and tags are key ways that we categorize and filter all of the content in the community , so if you’ve got a specific interest, make sure to subscribe to that tag to get updates in your inbox. You can find the list of topics on the homepage, under Tags in the main menu, or on any individual question or discussion page. – Start your own threads. Of course, it’s not just about seeing what’s already on the site. IT Knowledge Exchange has always been about taking action, and you’ll find handy widgets where you can add your own questions or start your own discussions throughout the site, on the homepage and on various landing pages. – Read our blogs. The most recent blog posts in our network will be featured on the homepage, but you can head to the redesigned Blogs page as well to view our full list of blogs and recent posts, now more easily accessible than ever before. Each blog will include a label denoting it as an editorial, member or vendor blog. That’s a quick tour of our new site – I’m really curious to hear your thoughts and get your feedback on what else you’d like to see. Add comments below or email me at brubenstein@techtarget.com or Michael at mtidmarsh@techtarget.com. Good job, Ben, great redesign. I started scrolling back through Community Blog posts to see if any were appropriate for comments about ITKE itself. Found this post on page 7 finally. So, I'll give it a shot. During the past couple weeks, a real problem has shown up for some posts. After a long bunch typing, I click the 'Reply' button. The result when the problem appears is that a red error banner appears above the comment block that says something about an error has happened and 'please try again' and that everything that was typed disappears. Sometimes(!) the reply text manages to show up later, but other times it's just lost. Only by waiting some unknown time and refreshing is it possible to find out if the whole reply must be re-entered. The red error banner fades away after a few seconds. That makes it hard to grab the message text to show to someone who might know what happened. I caught the error message for one comment: "There was an error processing your information. Please try again later." If the result was predictable, it'd be better. But because the reply sometimes gets posted successfully (eventually) and sometimes just goes nowhere, it's frustrating. The unpredictability of when (and why?) it happens is also frustrating. That's all I know about it. Other than that, if anyone sees this, is there a "discussion" area for the site, about the site? This 'Community Blog' seems less and less appropriate. I could use email, but it seems better if members can all comment. Thanks for whatever is possible. I have noticed that some of your comments have been caught by the spam filter. That's most likely why you're seeing an error message. I've also added you to our comment whitelist so you shouldn't run into this issue again. If you have any other issues you'd like to talk about and don't want to post it on the Community Blog, please feel free to email me. Ah! That's at least understandable. Sorry about posting here and then posting under 'Discussions'. But it wouldn't show up here -- got the red banner error. Had to try something.